In 1917, the Department of Information approached well known British artists to contribute to a portfolio of lithographic prints. The brief was to create images that would encourage a war-weary public and raise support for the ‘war effort’. In effect they represent modern-era British political propaganda in its early stages. Sixty-six prints were produced under two headings, Efforts and Ideals, and published in an edition of 200 by the Fine Arts Society. It was the single most ambitious print project of the war. Although some woman artists were approached, the commissions all fell to men including some of the most celebrated of the era. Of the 18 artists chosen, 12 were commissioned to produce a single allegorical work on the ‘ideals’ of the war and nine, including three of these same artists were asked to produce a series of monochrome images on themes related to the war efforts. The prints relating to the Ideals theme are the least successful. They are more overtly and perhaps necessarily propagandist so the imagery has aged less well. Most are concerned with the idea of sacrifice, and employ a rather hackneyed sense of nostalgia for some supposed lost age of chivalry. There are two that stand out. Maurice Greiffenhagen’s ‘The Restoration of Alsace Lorraine to France’ which is a monumentally still vision of Marianne, the revolutionary French symbol of liberty and reason supporting two other slighter women representing Alsace and Lorraine. By contrast, the great printmaker Frank Brangwyn’s looser ‘The Freedom of The Seas’ shows a group of sailors fending off a gigantic octopus. With its strong outlines, vigorous hatched shading and simple colour tones, it creates a stirring impression of conflict on the high seas. The Efforts series, concerned nominally at least with recording actions or events allows the artists’ greater freedom to play to their pictorial strengths. CRW Nevinson had direct experience of the front line with an Ambulance Unit and was able to harness his Futuristic sensibilities to create the wonderfully mechanistic and belt-driven patterning of ‘Making The Engine’ from his Making Aircraft series. Meanwhile, his ‘Banking at 4000 Feet’ produces a genuine sense of vertiginous height and movement. 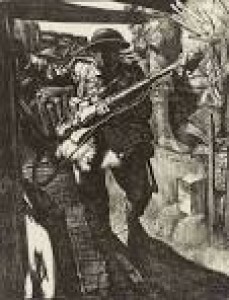 In Eric Kennington’s Making Soldiers series, I imagine the artist manages to stay just the right side of government censure in his prints ‘Into the Trenches’ (pictured) and ‘Over the Top’ with their lack of any sense of the supposed glory of soldiering and a feeling of claustrophobia, fear and discomfort. His ‘Bayonet Practice’ is at once classically formal, almost a sporting illustration, and yet chillingly faceless with row after row of limbless practice stabbing sacks behind. Frank Brangwyn produces six wonderful prints for the series Making Sailors. Two, ‘The Look Out’ and ’The Gun’, manage to convey a genuine sense of the war going on, one by desperate action and the other by its opposite and perhaps more commonly held memory of war, the long hours of waiting and boredom. George Clausen’s Making Guns series is marvelously atmospheric, all sparks flying, molten metal pouring, ending in the brutal stillness of the finished product, the guns. Muirhead Bones’ Building Ships series uses scaffolding, soaring cranes and triumphant perspective to dwarf humanity. William Rothersteinm by contrast, produced six prints on the theme Work on the Land. Only by their inclusion in this exhibition do we remember that war needs not only troops and weapons but food. These beautifully simple and linear compositions represent every bit as much of the war effort as the foundries and shipyards. The importance of efficient farming could not be overestimated at a time when U-boats were attempting to blockade Britain. It is noteworthy how many of the figures must have been from the Women’s Land Army. This is not a wild and exciting show. The prints were better served in their more intimate display at the National Museum in Cardiff in the summer of 2014. The scale of the room reduces them. With their monochromes and pale colours they do not leap off the wall and cannot leap across the room but it is an exhibition that rewards close study. These artists, who chose to put their talent at the service of their country, were certainly paid, but could have refused. At first glance the work seems cleansed of the horrors of war but there is still the very real sense that it is there, just out of shot. No one in 1917 could have been unaware of it and it is the tension between this knowledge and the making of an acceptable image that is one of the chief pleasures of this exhibition. That and its outstanding draughtsmanship. 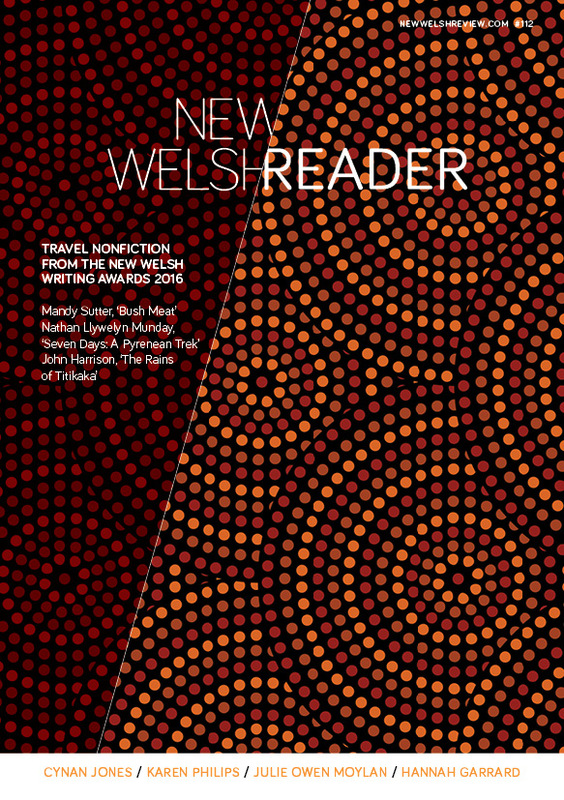 Michael Tomlinson blogs on art for New Welsh Review.